TASER® Shoulder Holster for the TASER® M18, M18L, M26 and M26C. Specifically designed for the above, but will also work for the TASER® X26, TASER® C2 and AIR TASER®. 1 - Nylon Shoulder Holster with under-arm TASER® Holster and 2 Cartridge Pouches on opposite side. Can be configured for left or right hand draw. Fully adjustable in every dimension for all sizes and setups. Attaches to belt with Velcro® loops. 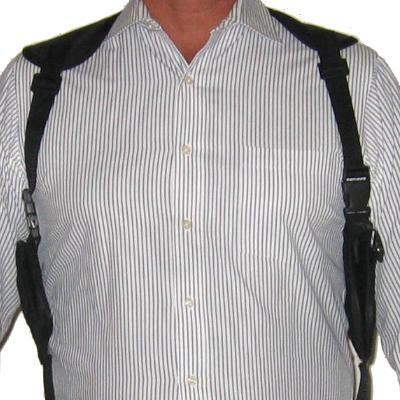 Designed for concealed weapon applications under suit or jacket. No Sales Tax in most cases. Free Shipping and Handling on all orders over $100.00.